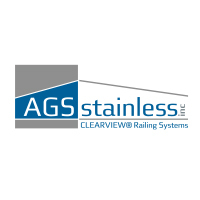 For almost 3-decades AGS Stainless has proudly manufactured the Clearview® line of custom-made, prefabricated (built off-site) railing systems for some of the world's most distinctive homes and commercial properties. Having your clients' custom-made railings prefabricated improves quality, reduces installation time and reduces project costs. Cut with the precision of a computer-controlled laser and welded and polished by hand, each railing component reflects craftsmanship at its finest. Contact us today to experience the difference that our personalized service and commitment to quality makes for your project.